On this short course, Trudie Hairon-Trox, journalist and walking guide for Jersey Walk Adventures, will give an overview of the centuries-old tradition of seaweed gathering in Jersey, as well as an insight into modern uses of seaweeds. 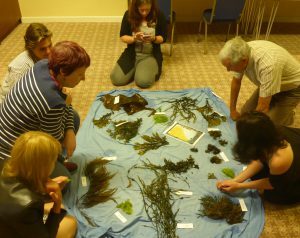 The course will help you identify the most common species of seaweed and will explain the best practice for foraging. It will shed new light on the value of the long forgotten vegetables of the ocean, which are regularly used in cosmetics, for herbal treatments and in delicious dishes. Thursdays 9 & 16 March 1900-2100. Adult Education. Philip Mourant Centre (Trinity). £35. Christmas walks on the seabed dates are now online. You can not book our walks on the seabed online. Dates of our walks on the seabed are now online and open for booking. Oct 24 Saturday – Walk with the Stars at Your Feet. Bioluminescence walk. 2130. EXTRA WALK ADDED. Our Christmas and New Year walk dates are now online here. A rare opportunity to walk over 1 mile offshore and watch a Total Lunar Eclipse on our Moonwalk to Seymour tower. A very low tide. Monday 28 Sept 0015 Book here. Jersey Walking Festival (12-27 Sept). Extra walk dates.